Call it all fruity flavoring, you are right. 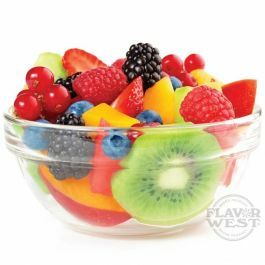 Cloud 9 flavor is a delicious blended mix of all your favorite fruit flavors. This flavor offers delectable taste with a subtle tart finish. Type: Cloud 9 Water Soluble Flavoring. Ingredients: Natural and Artificial Flavoring, Propylene Glycol. USP Kosher Grade Flavoring. Usage Rate: 15-20% for E-use. Flavor suitability: beverages, chocolates, drinks, vegetables, fruits and chocolate desserts, caramel, bakery recipe and more. Specific Gravity: 1.02 No Refunds on Flavoring. Great fruity flavor, very light and sour but tolerable when mixed with another fruit. Best All Day Vape Yet!!! Mixed this at 12.5% as a max VG e-liquid. WOW! After a 2 week steep, this is now my favorite all day vape! My customers are getting hooked on my supply! Try it and you will not be disappointed!